Reger’s clarinet sonatas are among his most recorded works, and the sheer range of interpretive approaches is fascinating. Reger gives detailed performance instructions—carefully assigned rits at ends of phrases, dynamic markings in almost every bar, and just as many hairpins—but he doesn’t give metronome markings. In fact, there are so many instructions, that the biggest challenge for performers is to decide which to honor and which to ignore. That has a bearing on tempos as well: At slower tempos, more of these nuances can be expressed. 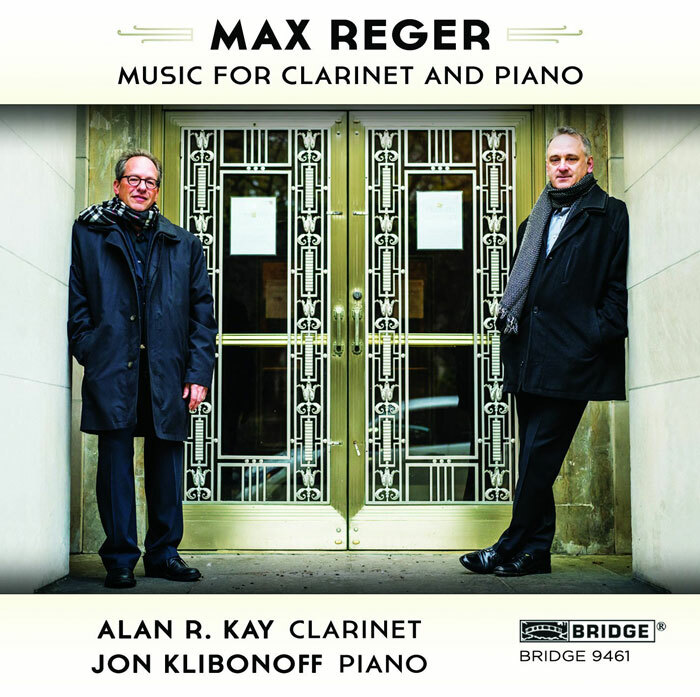 The problem is that Reger’s music often, and certainly in the clarinet sonatas, relies on a sense of flow, of long, unbroken phrases holding the music together. Those long phrases are fragile, and often suffer at slower tempos. Alan R. Kay and Jon Klibonoff skillfully negotiate these paradoxes. Their readings are relatively slow, though not the slowest on disc, and generally focus on localized phrasing issues rather than the coherency of the longer spans. That results are seductive, especially in the way that each phrase is carefully and tenderly shaped. Kay takes Reger at his word, where others generalize. For example, in the First Sonata, the clarinet is often asked to enter ppp and then diminuendo through a long hairpin: We hear such details every time. Add to that a clarinet tone that is always elegant, and the results become even more appealing. Kay’s timbre is warm and round, but varied too and, like his dynamics, often reaches out to extremes, from soft, even imperceptible entries to robust, angular climaxes. The downside is a lack of focus over the longer spans. These performances can feel slower than they actually are, for the painstaking attention paid at every point to the details of the moment. 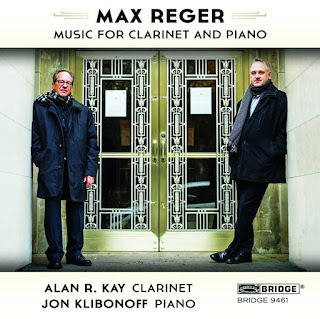 Despite his reputation to the contrary, Reger does think about the bigger picture, and each of the movements of these sonatas is subtly graded and elegantly structured. The other mark against this recording is the occasionally distant and indistinct piano tone. It is not a big problem, but it starkly contrasts the clarity and immediacy with which the clarinet is recorded. Reger’s music is well-represented on disc, but almost exclusively on German labels. So it is interesting that the substantial discography of the clarinet sonatas includes recordings from many other European countries, as well as several from America (there is even a previous recording on Bridge, although in an arrangement for viola, performed by Barbara Westphal). That may be a result of the enthusiasm of clarinetists for the works, stylistically just a short step from the Brahms sonatas. It might also account for the diversity of interpretive approaches. Of the two other recordings in my collection, the Janet Hilton/Jakob Fichert version on Naxos (8.572173) is the least attractive. Like Kay and Klibonoff, Hilton and Fichert take slow tempos, considerably slower in fact, to fit in all the details. Just as here, those details don’t always contribute to the overall experience, and Hilton’s often harsh clarinet tone is hard on the ear. More impressive, and my recommendation for the op. 49 Sonatas Nos. 1 and 2, are Florent Héau and Patrick Zygmanowski on Zig-Zag 090303. Their reading is faster and more coherent, and, while the extremes of dynamic and tempo are leveled out a bit, you never get the feeling that you are missing out on anything. One thing you are missing out on though, is the Third Sonata, op. 107, which does not appear on the Zig-Zag release. But it’s no great loss: The work feels generic and uncommitted in comparison to the more inspired and passionate op. 49 pair. As a bonus, Kay and Klibonoff include two elegant miniatures, the Albumblatt and the Tarantella (the Albumblatt is also included on the Héau/Zygmanowski, where, typically it is considerably faster). Opening with the Albumblatt is an excellent idea. It offers a gentle introduction before the players move on to the more serious business of the sonatas. But even when that main program begins, nothing here ever feels labored or excessive, despite with the players’ unwavering attention to detail. An attractive disc all round, and an excellent introduction to the composer’s work, especially for those who fear his dour, Teutonic reputation, which is easily forgotten when listening to these light and effortlessly melodic works. This recording documents a very special concert. Stanisław Skrowaczewski, who had recently turned 92, brought a lifetime of experience to his performance of Bruckner’s Fifth with the London Philharmonic. I attended the concert myself, and it was an extraordinary event, not least for the many surprises in Skrowaczewski’s interpretation. But the recording is a different experience, no less valuable but just as interesting. In the concert hall, Skrowaczewski’s stage presence has a strong bearing on perceptions: We see a frail, hunched figure and inevitably contrast this against the lucidity and focus of the music-making. Listening to the recording, we can feel Skrowaczewski’s experience all the more keenly for not having to concern ourselves about how he communicates. 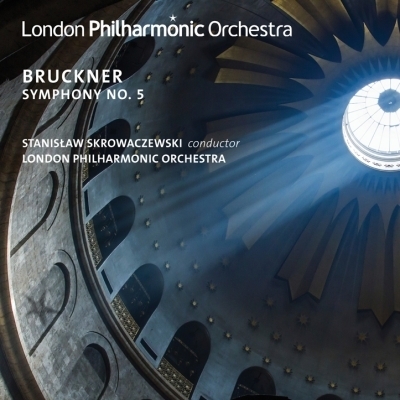 For several reasons, this isn’t one of the greatest recordings of Bruckner’s Fifth available, but it is one of the most distinctive, and probably one of the most profound. The blurb on the back of the box describes the reading as “an interpretation of humility,” and that idea rings true. Skrowaczewski’s most significant departure from the norm is his treatment of the chorale that dominates the finale. While he retains a feeling of transcendence here, it is always compromised, as if the religious narrative is being followed, but qualified by doubts, or by experience. He doesn’t swell through the phrases of the chorale; the brass play it straight, and slightly elide the final note of each phrase. And when the chorale is set in counterpoint to busy lines from the woodwinds, they are often given equal prominence. It is an interpretation that asks more questions than it answers, but that suggests depths of complexity to Bruckner’s theology and psychology that most conductors ignore. Skrowaczewski also surprises in the earlier movements. While the opening movement is dynamic and never lacking pace or excitement, the caesuras he holds before climaxes are often long and unpredictable, but each feels exactly right. His phrasing is expert throughout, and the melodic elegance of the first movement is enhanced though a subtle rubato, by which the peak of a line is fractionally held, increasing intensity but without disrupting the flow. He has a good sense of line, but never subsumes individual phrases; each is given its due as a subtly distinct perspective on the bigger picture. So too in the Adagio, a performance of great expression and often daring rubato, but no sentimentality. In the performance, Skrowaczewski moved attacca from the Adagio to the scherzo, and that is retained on the recording. Live, it was clear that Skrowaczewski kept the scherzo nimble by using only a minimum of physical gesture to convey the beat. That lightness is just as clear on the recording, where the movement is dominated by the propulsive strings rather than the brass. For all his humility in the finale, Skrowaczewski still gives an expansive reading, at over 25 minutes. Many fascinating details come through here, especially from the woodwind. One real surprise is a flute figure 11 bars from the end, the two flutes playing legato quarter notes against the rest of the orchestra. I had never heard this before, but it fits well into Skrowaczewski’s more human-scaled account. In the concert hall, I noticed a few moments of poor ensemble, which I attributed to lack of clarity in the conductor’s beat. Listening to the recording, the problem seems to be located almost entirely in the violin lines. There is some surprisingly scrappy playing here. Many of the violin entries are not unanimous, and there are often tuning issues when the line goes above the staff. There are also a few moments of poor ensemble from the brass, but not as serious. Those string problems do detract, but don’t disqualify this account from high recommendation. They suggest that Skrowaczewski’s age may be finally catching up with him, but do little to blunt the originality and insight that he brings. Sound quality is impressive, clearer and more involving that on many previous LPO releases. All round, this is a unique and revelatory experience—Bruckner’s Fifth as you’ve never heard it before. This review appears in Fanfare Magazine, issue 40:1.